A loch side walkway / lookout point next to the Forth Valley Hospital near Sterling. The concept is enhance treatment through contact and a shared intimacy with nature and thus the emphasis is on the tactile, sensory aspects of the context in order to engage visitors. 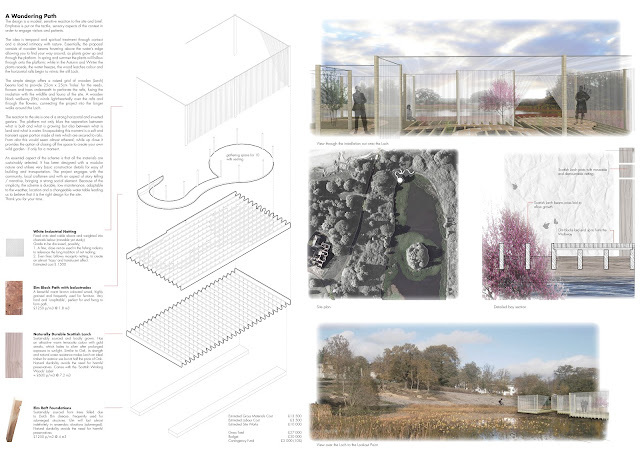 The proposal consists of wooden beams hovering above the water as plants grow up and through the platform. A raised grid of Larch beams laid to provide 25cm x 25cm gaps for the reeds, flowers and trees underneath to grow through, fusing the insulation with the wildlife and fauna of the site. An Elm block walkway winds through the flowers, connecting the project into the longer walks around the Loch. The upper section is made of nets secured to rails, providing the option of closing off the space. An essential aspect of the scheme is that all the materials are sustainably selected. It has been designed with a modular nature and utilises very basic construction details for easy of building and transportation. Because of the simplicity, the scheme is durable, low maintenance, adaptable to the weather, location and a changeable water table.